Joe “King” Oliver’s innovative and influential recordings from 1923 with his Creole Jazz Band are his most famous sessions but he proved to be an adaptable cornetist and bandleader. After making more history with his Dixie Syncopators during 1926-27, he recorded a series of enjoyable hot dance band recordings during 1929-30 that perfectly fit the time period. Unfortunately Oliver’s physical problems (bad teeth partly caused by too many sugar sandwiches in his youth) resulted in it often becoming painful for him to play the cornet by 1929. While there are some good spots in his later recordings (“Too Late” has some of his greatest playing and “Struggle Buggy” is excellent), he often had others, including his nephew Dave Nelson, Louis Metcalf, Henry “Red” Allen, and guest Bubber Miley, take the cornet/trumpet solos. 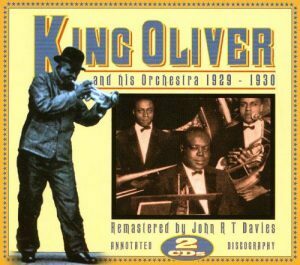 The two-CD French RCA set King Oliver And His Orchestra 1929-1930 is one of several ways to acquire his underrated recordings of the era. It includes the master takes of all of the Oliver selections during this period (other than “When You’re Smiling”) and, other than three sessions from 1931, it contains his final recordings. With fine solos from trombonist Jimmy Archey, altoist Hilton Jefferson, pianist Don Frye, and the various trumpeters, along with excellent writing from the uncredited arrangers (which might have included Luis Russell), the music is quite enjoyable and sounds modern for 1929-30. It makes one wonder what a healthy King Oliver might have accomplished during the swing era.